The featured image for this post I initially saw on Twitter back in May when AAM held their annual conference in Washington, D.C. and it instantly caught my eye with its simple yet powerful message. This and other equally powerful GIFs were created by Spanish artist A.L. Crego and this GIF in particular was accompanied with a link to an article by The Creator’s Project. It’s a short piece and I suggest giving it a quick read, but in summary, it explains how the artist uses GIFs in order to deliver a message in a way that hasn’t been done before, using the internet. 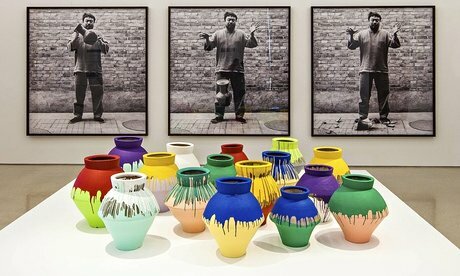 Artists have always used different methods of creating in order to speak without speaking, from stained glass windows with biblical stories to Ai Weiwei’s brightly painted Han dynasty urns. But while artists are almost expected to break the rules, be provocative, and take a stand, museums have merely been the vessel that holds the collection of accumulated statements and artistic freedom of expression. I can’t think of a time (without doing some research) when a museum in generations past took a firm stand on any social issue (please correct me if I’m wrong). But with globalization connecting all of us closer thanks to the internet and Facebook (among other social media outlets), museums have slowly woken to the importance of being vocal to issues that affect us all and using social media to take their own stand. The Holocaust Memorial Museum in D.C. made headlines when they firmly condemned what is happening to the people of Syria and the war that has raged on, creating a YouTube video marking the fifth anniversary of the crisis and a tab on their website that supports the hashtag #savesyria along with more information on the situation. But it made headlines because rarely have we seen a museum take such a decidedly strong stand on a political, social issue. The museum world shook when news broke out that archaeologist Dr. Al-Assad was taken hostage by ISIS and promptly killed. A few individuals in the museum field took to their blogs but what I didn’t see was a voice that rose as loud as the Holocaust museum’s did for an event that is probably far less “political” (in that I doubt a museum would face any backlash condemning the killing as the Holocaust museum has seen for their stance). The new National Museum of African American History & Culture takes a hard look at slavery and inequality over the years in the United States and makes the statement through inclusion in their exhibition and digital displays outside of their building that they support the Black Lives Matter movement (which has courted controversy as well). No matter how obvious the right path may be, a stance is a stance because there is an opposing view and museums have usually played it safe. Museums are excited to use every aspect of social media because of the mere potential it holds in reaching audiences but should museum institutions be actively conscious of the world around them or just show artists that can adjacently do it for them? As fun as it’s been to use Snapchat for filters and Instagram for photogenic exhibits, Twitter has been a powerful tool in raising awareness for many causes (Google: Twitter Revolution) so should museums engage their audiences to think deeply about the issues that affect us all and how? Featured image via The Creator’s Project.